We were looking at the government's Marriage Allowance for last week's Finance Fridays. With the gardening season now in full swing we're seeing how to save money on your garden plans. Whether you have just a balcony, a large back garden or an allotment there are many ways to keep the cost down. 1. Do your research – All gardeners can get carried away with plant purchases. Make a list and compare the deals in local garden centres and nurseries before buying on impulse. 2. Free seeds – Look for internet promotional deals on free seeds. In recent years both Heinz and Dolmio have given away free tomato seeds. 3. Reuse first– Before you recycle your plastic bottles cut them up and use them as cloches for delicate seedings and those prone to bird attacks. You can also start off seeds such as sweetpeas in loo rolls and then plant them directly into the soil. I also use plastic food trays as seedling trays or as water trays for individual pots. 4. Go potty – Keep any pots you lay your hands on. Garden centres often have used pots that are available to take away for free. Just make sure you clean them well to stop any plant diseases spreading. 5. Compost corner – Make your own nutrient rich compost by filling a suitable container with your kitchen vegetable peelings, egg shells, tea bags and garden clippings. It can take a time to come together but the benefits are huge and saves so much from going to landfill. 6. Coffee grounds – Many supermarkets now have cafés attached to them and they get through a lot of fresh coffee. Waitrose have bins of coffee grounds which they let customers take away for free. I've noticed my local Morrisons are now doing the same. The nitrogen in them makes a great feed for vegetables and plants. They can also help to stop slug attacks due to their gritty texture. 7. Just say yes – What ever garden item you are offered then say yes to it. You can work out later if you need it. By saying yes in the past we have been given a wooden playhouse, shed, slide and tower plus a garden compost bin. 8. Join a gardening club – You'll get a wealth of free knowledge plus other members will be happy to share their excess plants with you. 9. Start a plant swap – If you work in an office this is quite easy. If you germinate far too many tomato, courgette or other seedlings bring them in and let people take them for free. Hopefully this should encourage others to do the same with their own excess plantings. 10. Casualty corner – Most places selling plants have a shelf with some cheap but very sorry looking plants on it. Be discerning but if a plant just needs a bit of TLC you could have bagged a bargain. 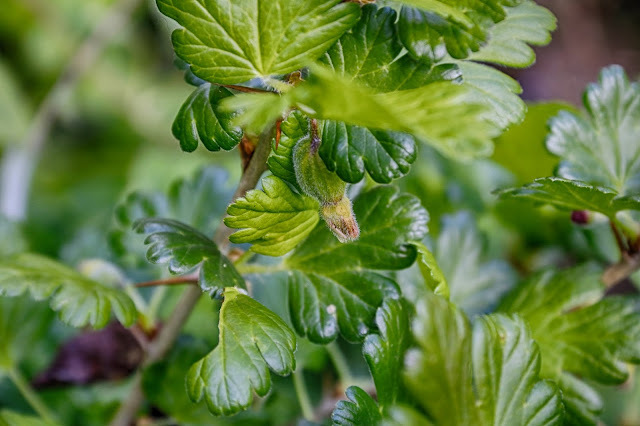 I have 10p gooseberry bush that was just a single twig with one green leaf on it when if left the supermarket. Above is how it currently looks. 11. Buy a book – Good quality gardening books can be expensive when new so raid the charity shops and car boot sales. Many people are given gardening books for presents only for them to be sent to the charity shop unread. You may think the internet holds all the answers to your gardening questions but it can get overwhelming as you look at site after site. Instead start off by looking out for a good, general encyclopedia by a well-known authority such as Alan Titchmarsh, Monty Don or the RHS. 12. Fill your trolley – If you're wanting cheap plants to fill summer pots and beds then don't discard your local supermarket. I needed a tray of violets for an Easter project and found tray of six plants at Aldi for £1.69. 13. Divide and conquer – Many plants you already have have can be split and then planted elsewhere in your garden. Check for the right time of year to do it but hostas, spring bulbs and hardy geraniums can all be split up. 14. End of season sale – It may only be the start of the season but come the end of summer seeds and equipment can be discounted greatly. I've seen in Wilkinsons that seeds can be reduced to 10p. They have a use by date on the packet and they are usually good for another two years. I also bought a spade and fork for £2.49 in Morrisons last September. Since we have bought £25 spades in the past to see them snap within weeks I decided to stock up whenever I find a bargain. 15. Quids in – At this time of year the pound shops have a stack of useful items that are worth far more than £1. I find them great for all their gardening tools that seem to constantly disappear like kneelers and trowels. 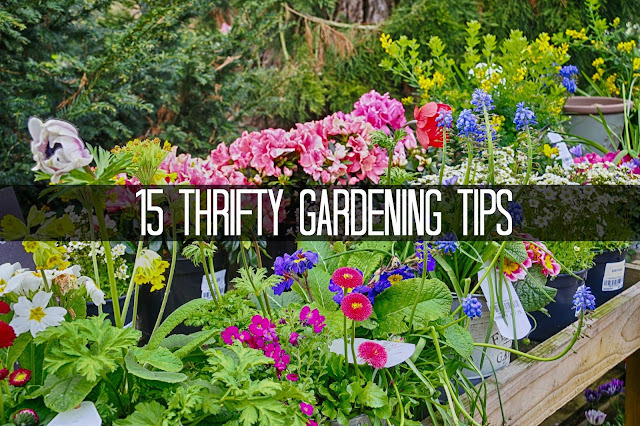 How do you keep down the cost of gardening? What are your thrifty gardening tips? If you want to join in with this week's Finance Fridays then add your link to the linky below. Any post concerning financial matters is allowed. Full details here. It doesn't have to be published today as you have until 23.55 on Tuesday 25th April 2017 to join in.